The Old Foodie: Christmas Guests: Menus for three days. Much of the population becomes very mobile around Christmas as everyone tries to catch up with relatives - friendly or not – over a few short days. Often this means overnight (or over several nights) visitors, who must be fed. As Christmas 1930 approached, the English newspaper - The Manchester Guardian - gave some very specific advice as to how to plan the menu for three days with visitors. Those who are expecting to have a larger number than usual in the house at Christmas-time may be glad of ideas for feeding their guests. With good supplies of pickled eggs and rashers of bacon ready to hand the breakfasts will require little thought. Then for afternoon tea there is sure to be a large Christmas cake, and this with some fancy biscuits and shortbreads as well as bread and butter, will be ample provender. 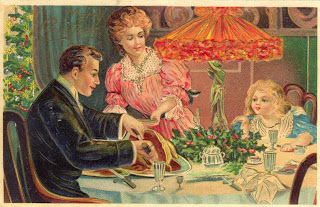 Presuming that hot dinners are to be served at midday and cold suppers given at night, the following will be suitable for these meals from Christmas Eve till Boxing Day evening. Cold ham (a large piece of gammon or whole ham on the table for the first time). Pork pie. Sliced beetroot in vinegar. Chocolate mould. Mincepies. Cheese, biscuits, and butter. Roast turkey (stuffed with chestnuts or forcemeat, sausages, bread sauce. Steamed potatoes, brussels sprouts. Christmas plum pudding, hard brandy sauce, hot mincepies. Dessert. Cold ham. Tongue. Tomato salad. Trifle. Fruit jelly. Cheese, celery, biscuits, and butter. Hot roast beef, horseradish sauce. Baked potatoes, cauliflower and white sauce. Apple and cranberry tarts, custard. Remains of ham, pork pie, and tongue. Beetroot and celery salad. Fruit salad. Mincepies. Cheese, biscuits, and butter. A great deal can be prepared for those menus before the actual holiday. [Christmas Day was on a Thursday in 1930] On Tuesday the ham may be boiled, the beetroot cooked, and a batch of mincepies made. And on Wednesday the turkey can be stuffed, more mincepies, and the fruit tarts made as well as the chocolate mould, fruit jelly, trifle, and fruit salad. Then the vegetables for the two days may be prepared and left in cold water to which a little salt has been added. With all these things in readiness, the rest of the kitchen preparations on Christmas and Boxing Days will prove a fairly simple matter. Here is a slightly different stuffing for your turkey – from The Times, in 1956. Chop a head of celery and cut up a bunch of watercress. Also chop an onion finely and cook in 1 ½ oz of butter with the celery for a few moments. Add salt and pepper to taste, and the watercress; continue cooking gently until fat is absorbed. Add, together with 2 oz. of melted butter and the grated rind of a lemon to a basinful of fine breadcrumbs. If a soft stuffing is required, moisten with a little cold water; if, on the other hand, a compact one is required, add a lightly beaten egg and a little scalded milk. Were I a philosopher, I should write a philosophy of toys, showing that nothing else in life needs to be taken seriously, and that Christmas Day in the company of children is one of the few occasions on which men become entirely alive." Robert Lynd (1892-1970), American sociologist. I really like your Christmas day menu and the quotation of the day is awesome. It was nice going through your blog. have a wonderful Christmas.